Epidurale steroïde injecties voor lumbale spinale stenose? 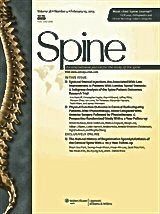 A four-year study involving 276 spine patients ages 53 to 75 published in the journal Spine suggests that we should--at the very least--take a deep breath and think twice before choosing epidural steroid injections to relieve the pain of lumbar spinal stenosis, not only because this oft-used treatment may not work, but also because it may cause more harm than good. Better yet and instead it might make sense to simply get in the habit of breathing deeply, which naturally lengthens the spine and helps relieve unhealthy stress on the vertebrae.... But more about Gokhale Method solutions in just a bit! Using well-established scales for measuring leg and lower back pain, the researchers found significantly less improvement among patients who had the steroid injections than among those who did not; this was true even among those patients who went on to have surgery. Despite conflicting reports about the efficacy of epidural steroid injections in lumbar spinal stenosis, 69% of spinal surgeons consider ESIs to be the first-line invasive treatment when exercise and physical therapy have failed. The Spine study—together with recent alarming reports of fungal meningitis, paralysis, and other risks associated with epidural injections—prompted me to tackle this topic today. I believe in the therapeutic value of mental imaging, but in order to visualize solutions to a problem, it helps to see and understand the problem, itself. Take a look at this information video. Not only do these bulges, spurs and hypertrophied ligaments and joints pinch nerves and cause pain in individual people, they represent a burden on our healthcare system and society at large. 8% to 11% of Americans are thought to be impacted by lumbar spinal stenosis. 2.4 million Americans are likely to be affected by 2021. As "boomers" increasingly qualify for Medicare benefits, government spending on lumbar spinal stenosis will no doubt increase. Additional evidence was provided by the Chairman of the American Society of Interventional Pain Physicians, who, in a 2012 review of Medicare records, found that the number of spine injections from 2000 to 2010 increased 159%. And the Centers for Medicare and Medicaid Services reported that in 2011 it paid providers $106.4 million for 252,288 injections, which averages out to $422 each. All of which raises the question: What can we do to prevent or manage lumber spinal stenosis apart from relying on costly epidural steroid injections, which may not work as well as people had hoped and which are now also associated with contamination and infection and other risks? All of these techniques involve lengthening the spine, which—by increasing the space between the vertebrae, as well as the open spaces in the spinal canal where the nerves exit—take stress off the places where stenosis occurs. 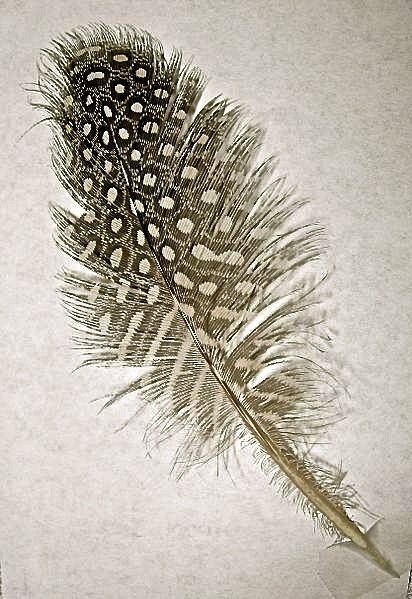 One way to enhance these powerful techniques is to use imagery, a method known to promote all kinds of healing, together with deep breathing, which will improve movement of macro- and micro- elements of the spine. 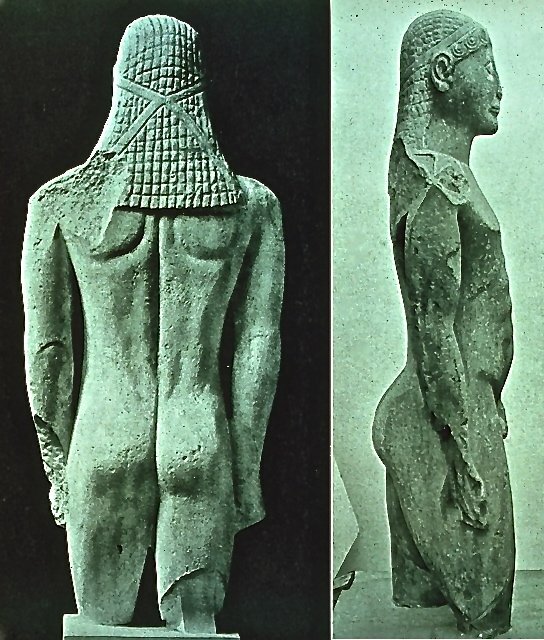 To begin to test this out you might now take a very deep breath and, as you feel your spine naturally lengthen, imagine what it feels like to naturally stand like the beautiful kouros figure, just below. As noted above, Gokhale Method stretching techniques involve lengthening the spine (including, of course, the lumbar spine). Reestablishing natural length creates space and helps relieve unnatural stress by decompressing nerve roots as they branch away from the spinal cord via the spinal foramina. Spine-lengthening techniques also take pressure off bulging discs that can cause pain when they press in against spinal nerves. Relieving unnatural stress on the vertebrae via spine-lengthening and reshaping may also confer benefits by slowing or even halting the formation of unhealthy calcium deposits, which, when they form bone spurs, can poke into the spinal column, compress nerves, and cause pain. Bracing the torso is also really important in preventing or managing lumbar spinal stenosis, and this can be accomplished by strengthening the deep abdominal and back muscles and making good use of what I call the "inner corset." We can actually relieve compression on the spine by transfering it to these strong central muscles, which are ideally placed to help carry the weight of the upper body. It follows that engaging the inner corset may also help minimize the pain that occurs when bone spurs intrude on the spinal cord or spinal nerves, as well as when spine instability (spondylolisthesis) narrows the spinal canal by allowing one vertebra to slip forward on another. With each inhalation, the spine lengthens and massages tissues in the back while relieving stress on entrapped spinal nerve roots. With the settling back that occurs with each exhalation, the natural massage-like action continues, and this goes on and on, with every breath. With the natural massage that occurs with each inhalation and exhalation, blood is pumped through the tissues around the spine, normalizing circulation in the area. Good circulation presumably normalizes related physiologic processes that might include calcium deposition and calcium reabsorption. Good circulation also promotes the flushing away of waste products. To sum up, stimulating circulation in the lumbar region—both of which are achieved through the Gokhale Method—are invaluable in the prevention and amelioration of stress on the vertebrae. Lengthening your spine and using your inner corset are things you want to be doing anyway, in the course of your usual activities—not only to clear up pain stemming from lumbar spinal stenosis, but to make you look and feel better, overall. Added perks of learning and practicing low-cost, no-hassle Gokhale Method techniques include zero risk of infection and other adverse effects, and—beyond the initial learning—no expenditure of precious time. You will learn to lengthen your spine and use your inner corset in Sessions 1, 2, and 3 of the Gokhale Method Foundations course, and in Lessons 1, 2, 4, and 5 of the book 8 Steps to a Pain-Free Back, as well as in Scenes 1, 2, 3, and 6 of the Back Pain: The Primal Posture Solution DVD. Hello, this message is for Charlene. Thank you for teaching our class! I'm still trying to "stack up" straight, but think I'll get it if I keep trying. The inner corset and the rolling of the shoulders help a lot....if only I hadn't tried to "stand up straight" all these years, I bet I wouldn't have had such bad posture! Could you send a list to my email of dates when you will be giving your alumni classes? Julie and I will come first sometime in July or later.